Who loves a good mini album? You know, the ones that looks awesome sitting on your coffee table, but then you open it and see that the inside is just as gorgeous as the outside! 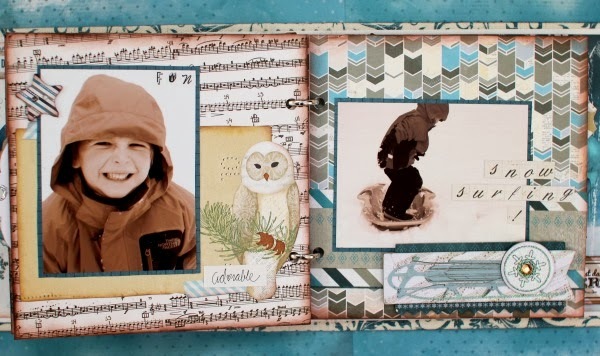 That is the kind of mini album that Tracee and Ilene have create and shared with you today using the Woodland Winter collection. Take a peak, you are going to be inspired to create one for yourself! 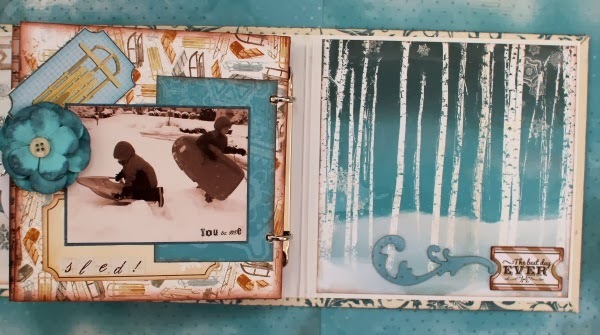 I have wanted to scrap these snow day pictures for quite a while, but they never quite fit on a layout, a mini book is the perfect solution to have them all in one place. 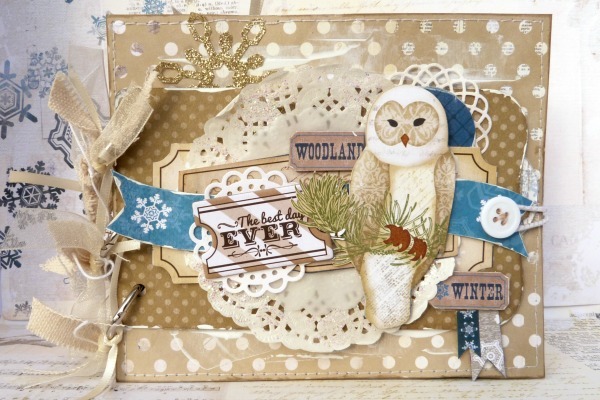 The Woodland Winter collection has to be my all time favourite winter collection in the most gorgeous shades of browns and blues. 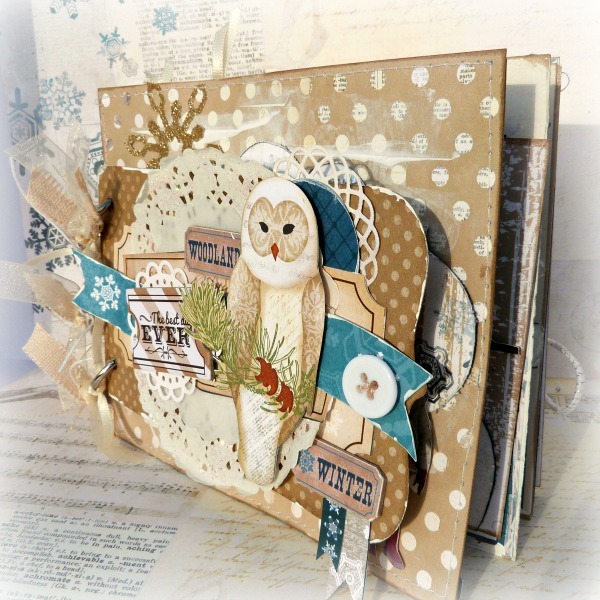 Owls are my favourite birds, so I fussy cut this owl from the 12 x 12 Cozy paper and added it to the front cover. The front cover was cut from Khaki Double Dot Cardstock and is smaller than the rest of the album. I wanted the rest of my pages to be a little larger. The finished album is actually 5 x 6 inches. To hide my Granddaughter's legs, which are dangling out from the next page. I cut some small strips in a banner shape and adhered them to the front cover. I love all the deer images that are on the papers. These pieces create their own little scenes which means you don't always have to add a lot to them before they look complete. 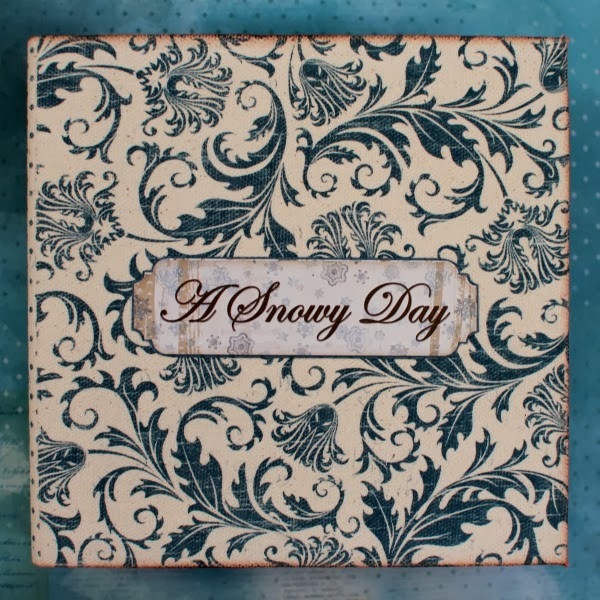 My title was created using the alphabet from the Woodland Winter 12 x 12 Combo Sticker. 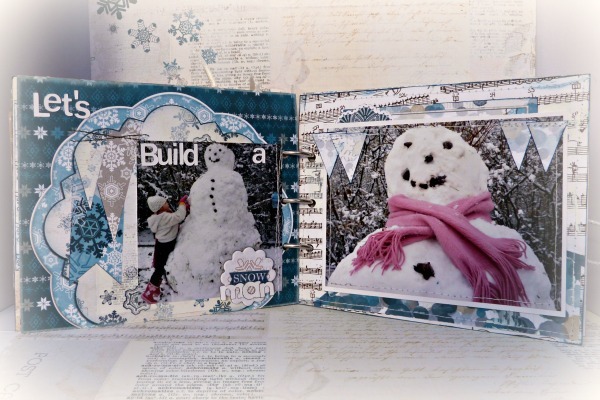 To create my title for this page I used one of the chipboard pieces and added the word "man" to spell out snowman. The banners on the left are already printed on the page and look really effective. I cut some triangles out and stitched them to the top of my photo to carry the banner look across the pages. 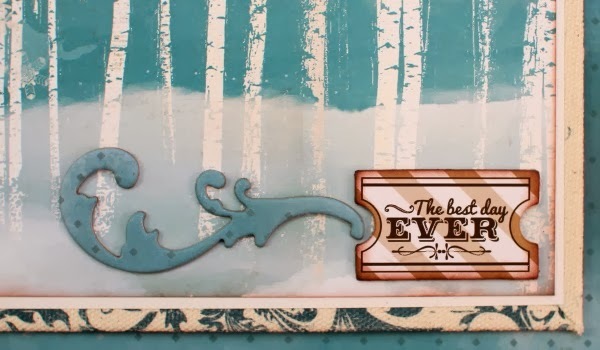 Bo Bunny not only makes pretty papers and embellishments, but they also package them beautifully too. 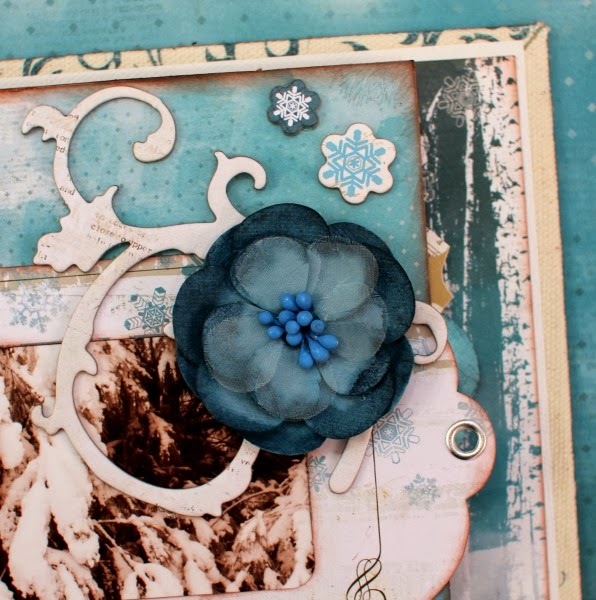 Here, I used the packaging from the Woodland Winter Buttons as a mat for my photo. I used the It Is Written Stamp to make the numbers for my pictures. 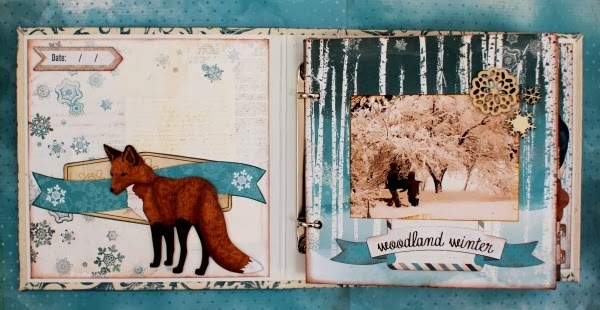 I also added some of the journal cards from the Woodland Winter Misc Me range as well. Everything coordinates so perfectly! I had SO much fun creating this mini!! 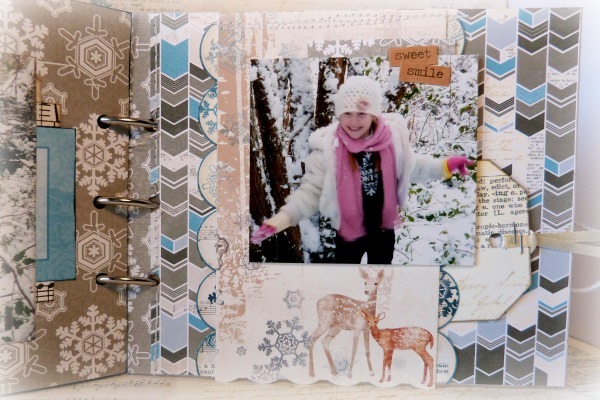 I really love snowflakes, winter, and birch trees. The "Woodland Winter" collection is all about that, so that probably helped. I had this old mini from years ago. 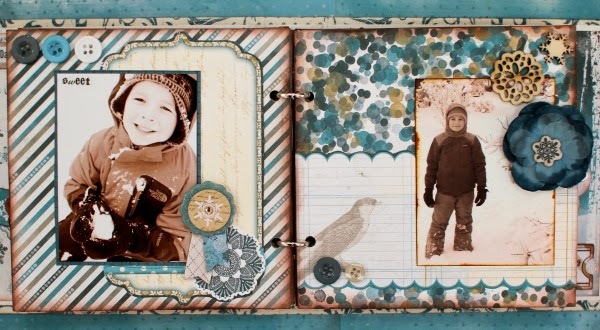 The cover is canvas with a blue swirl pattern that matched the collection beautifully. The cover material is already so busy-looking, that I didn't want to add too much. Just the simple title sticker from the collection was perfect. Another great thing about this mini was that the pages were 6 x 6 - so the 6 x 6 paper pad was perfect to use - just tear out and glue it on. Super easy! All the wonderful stickers and embellishments that go with this collection make it really easy to decorate. I edited all of my pictures to make them sepia tone. I wanted to match the collection better and it created a more uniform look for the mini album. 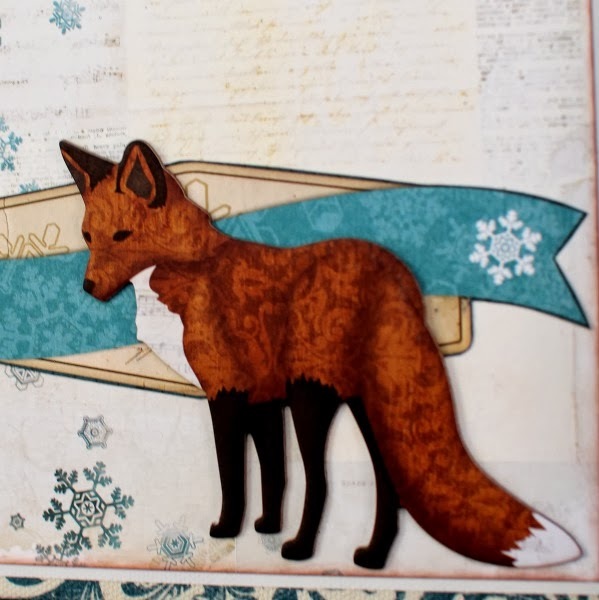 Ok... how awesome is this little winter fox from the 12 x 12 Chipboard?! I just had to include a close-up of the gorgeous details of the Bo Bunny embellishments. 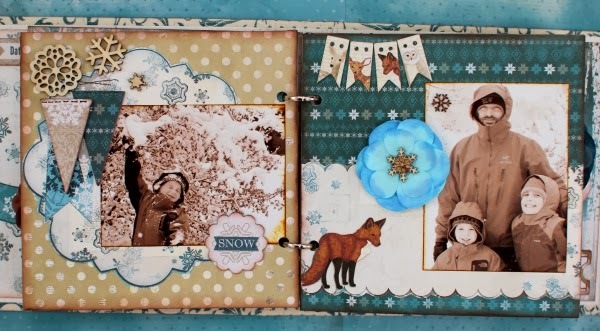 Here, you can see how well all the embellishments from the collection go together - the 12x12 chipboard, the letters from the Cardstock Sticker sheet, the flower, the chipboard swirl, and the snowman from the Noteworthy pack. 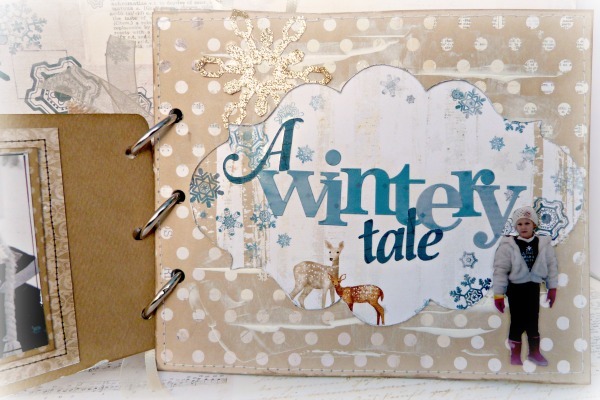 Throughout the mini, there are plenty of spots I left to add journaling, as well as the date to the front inner cover on the chipboard "date" sticker. 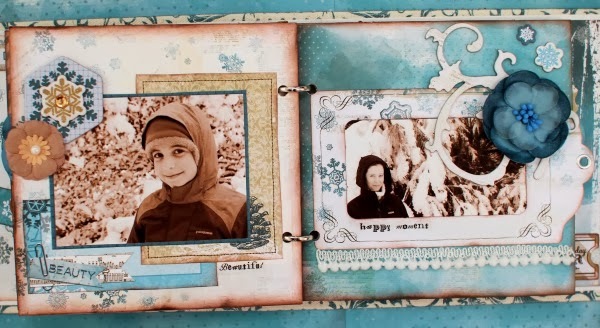 It's nice to be able to include some memories, and the Noteworthy tags as well as some of the lined patterned papers make it easy to do that. And here are the rest of the pages, and more close-ups of the awesome extra's that come with all the collections. This large tag from the Noteworthy pack had an image in the middle that I was able to punch out. That made the tag into a little frame. To give it more detail, I inked it and added a silver large eyelet. Wowee, these albums are truly gorgeous! I love, love, love them! The albums are gorgeous and fun. Love this collection. So beautiful! I love the photos too: the old look.